First let’s get this out of the way. Why the 35k? Even the event briefing booklet describes the 35k (and to a lesser extent the 57k) distance as a ‘taster’ for the ‘big one’, the 105k. I’ve done the 105k twice (in 2015 and 2016) so why would I now want a ‘taster’? Surely that would be like buying a bottle of wine, drinking it, and then paying for a tasting of the same wine! According to the race briefing, the 105k has about 1600m of elevation gain. (To put it in perspective, that’s less vert than the Yurrebilla 56k. Walk in the park, right?) The 35k on the other hand, has about 1000m. In other words, more than half of the overall elevation gain of the 105 is in the first 35. So it’s not exactly an ‘easy’ option! I didn’t really want to do the 105 again. Not this year. 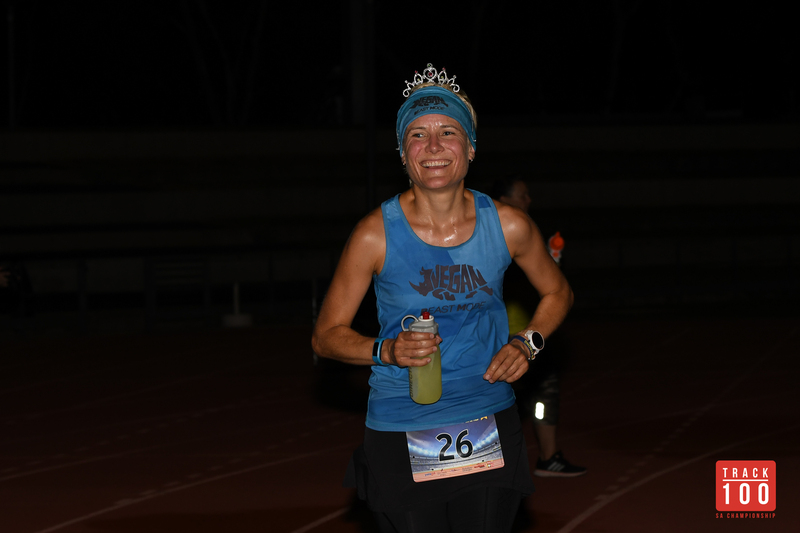 Everything fell into place last year – I managed just under 13½ hours and I didn’t see how I could have improved on that this year. Truth be told, the main reason I entered in 2016 was because I had ‘unfinished business’ after notoriously getting lost just after leaving Checkpoint 3, costing me a good half hour. That point has now been permanently marked with my name as a reminder – I challenge ANYONE to get lost there now! Justin and Vicky paying the appropriate respect to ‘Jane’s post’! I didn’t really start training for this event until late September, so I probably wouldn’t have been prepared for the 105k or even the 57. 35 seemed like the perfect distance! Also, it would allow me to be at the finish line to see the 105k runners finish (and that promised to be quite an epic party!) and also do a bit of volunteering. 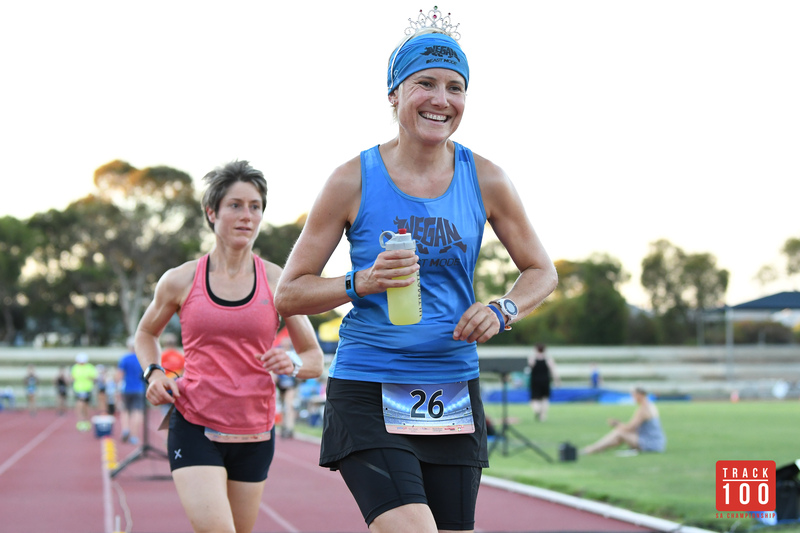 Other than my usual diet of road running, my training for the 35k consisted of 3 long trail runs, punctuated with the McLaren Vale Half Marathon. I was also doing a bit of flat cycling, mainly just to get used to the bike and the cleats in preparation for dipping my toes into the triathlon world. I’m not sure if this was a help or a hindrance! I didn’t make it to either of the official training runs for the 35k due to other commitments. I also couldn’t be arsed driving all the way down there to do the runs by myself on another day. I’d run the 105k twice (so theoretically I had also done the 35k twice) plus I’d run the course in training runs in previous years. My training runs were all the same. Adelaide trail runners would probably be quite familiar with this route. I would start on Waterfall Terrace, just at the end of Waterfall Gully Road, run up to the start of Chambers Gully, follow the Chambers Gully Track, Bartrill Spur Track, Long Ridge Track and Winter Track back down to Waterfall Gully Road, then run down the road, do that loop all over again, and then run back down to the coffee shop for a well earned coffee and vegan Snickers! It was around 23-24km (depending whether or not I went up to the Long Ridge Lookout) with about 700m elevation gain. As I kept doing the same route again and again, I got better at it, including being able to RUN the whole loop on two occasions, AND, finally overcoming my fear of running down the steep bit of Winter Track just after the hairpin corner! You know THAT bit – where you have to decide whether you’d be better off faceplanting on the gravel or diving headlong into blackberry bushes. (Interestingly enough I’ve never done either of those things!) I would normally be quite hesitant here and try to almost walk down, but the first time I did the ‘double Chambers’ run, a switch must have flipped in my brain and suddenly I realised I could run straight down! In the lead-up my last ‘proper’ run was on Tuesday, followed by a swim on Wednesday and a slightly abbreviated run on Thursday. Just part of the beautiful section we marked! I can highly recommend having a go at course marking if you get the opportunity. Especially on such a well-marked trail as the Heysen. Generally you do it in pairs so you can meet up at the end of your section, take one car back to the start, and then when you get to the end you have a car to drive back! Last year I marked with the experienced Tina, this year I was the ‘master’ and Kate was the very able ‘apprentice’ – it’s definitely a good idea to go out with someone who’s done it before! Nope. Definitely do not attempt to walk this trail. It’s truly awful! I do not recommend it! One thing I took from last year’s experience was the idea to bring a pair of secateurs to trim back bushes that were obscuring signs, and also tidy things up where they were really overgrown, to make it easier for the runners to get through! Kate doing a little gardening! Before meeting up with Kate I had my first blonde moment of the weekend. I went to Myponga for a toilet stop, and while I was there got a message from Kate to say she was running late. So I decided to get myself organised and get out all the stuff I needed from the boot, including my old trail shoes which I put on the roof of the car. You can see where this is going, can’t you? Heading back down the main street I noticed a shoe in my rear window. That was weird! Then I remembered! I quickly pulled over and found just the one shoe, so I turned around and went back towards the toilets, sure enough there was my other shoe right in the middle of the road! Fortunately it hadn’t been run over! 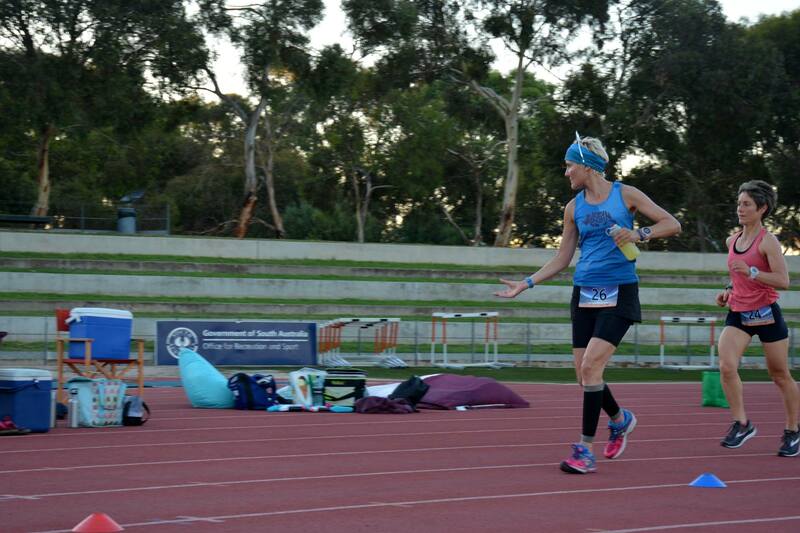 I wasn’t too bothered about the shoes themselves – they were retired, and I had brand new ones to run Heysen in, but I DID need the orthotics that were inside, and I DID need the shoes to do the course marking – I don’t think my pink Birkenstock sandals would have cut it, somehow! The 45km sign that marked the end of our section. It wasn’t until we got to the end, where my car was parked, that I realised we could have left this sign in my car rather than Kate having to carry it the whole 10k! Because we took so much longer than I’d anticipated to mark the course, it was a bit of a rush to get back to Adelaide, run a few errands, gather up all my stuff I needed for the next few days, and drive back down south to Victor Harbor where I’d be spending the night. 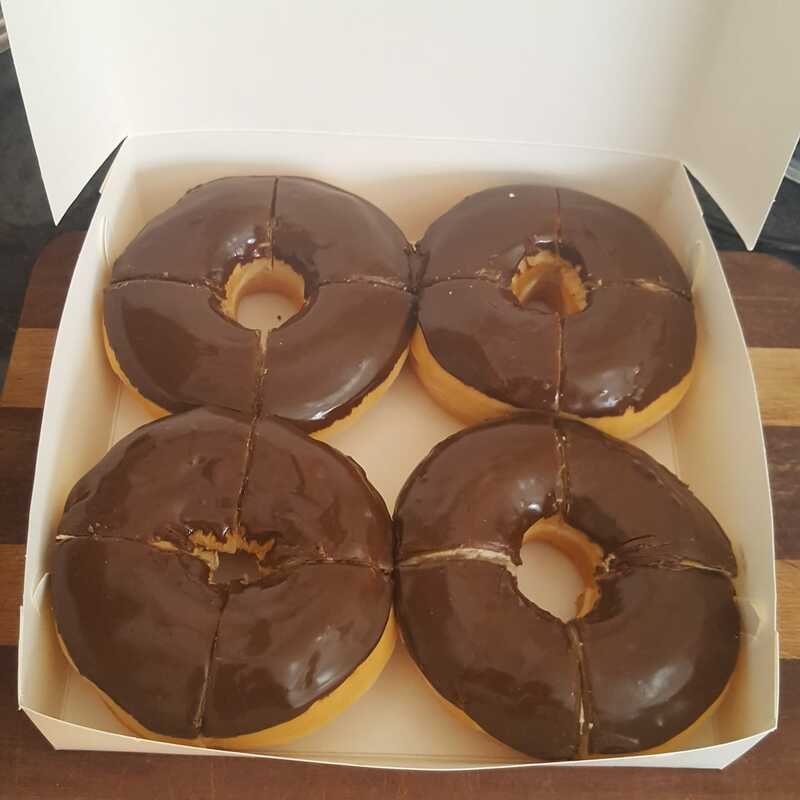 It also meant that one of the items on my list, a trip to the Bakery On O’Connell for vegan chocolate donuts, unfortunately didn’t happen! I always feel like I’m organised, even when I’m really not, if I have a list to work from. It helped that I had done the 105 twice before, so I had my list from last year as a guide! Friday night was a vegan pasta carb loading feast at Simon and Clo’s place, around 10 minutes from the start line. They had kindly invited a lot of running friends to come for the feast and stay the night if we wanted! 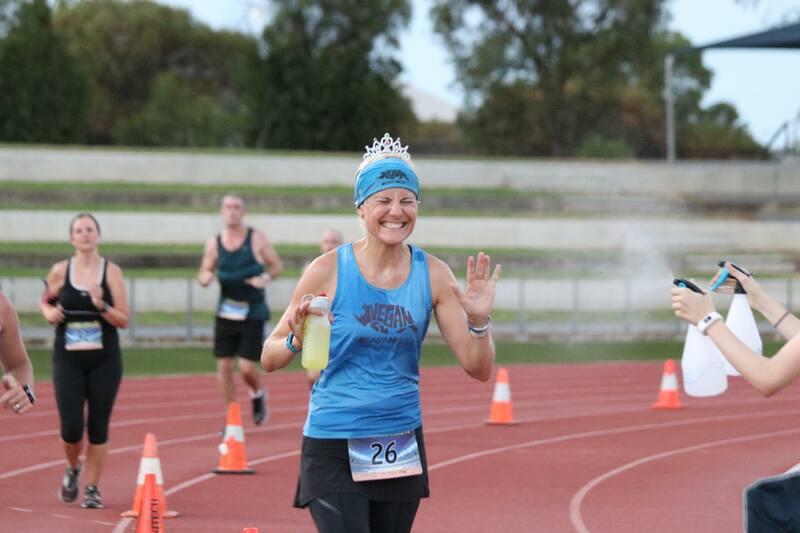 For me, even though my first port of call on race day would be my finish line at Myponga, from Victor it would be about a 25 minute drive versus just over an hour, so it was well worth it! 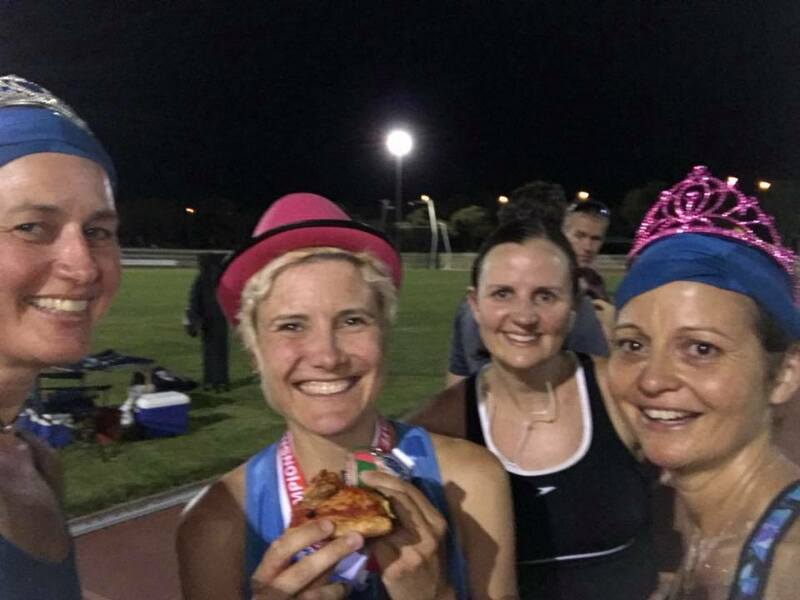 At dinner were fellow Heysen runners Sam, a Victor local doing her first 100k and Tyler, last year’s 57k winner back to do it again. Volunteers Tania (also Tyler’s mum) and Liam were also there for the dinner, and super volunteer Tracey popped in for a while before heading down to camp at the start line. I had to hold myself back from going crazy with the pasta (and falafel, and hummus, and Sam’s bliss balls, and Tracey’s raw carrot cake, and the rest!!!) as I had to remind myself I was ‘only’ doing the 35k! I put the cushions from the couch on the floor, set my alarm for 4am and had a very comfortable night’s sleep, under the watchful eye of Whiskers the cat! To be woken by a cat sniffing my face was nothing new for me – I felt quite at home! I woke naturally just after 3:30, then closed my eyes for a bit and when it was 3:45 I decided I might as well get up and start the day – I had to leave around 4:45 to get to Myponga. My outfit for the day was a bit of old and a bit of new. Starting from the bottom, I had my new trail shoes which I’d christened on last Sunday’s trail run, and old white Nike socks (I prefer black for the trails but my only pair of black Nike socks had a hole in them and I hadn’t been able to find a replacement pair) and black calf sleeves. I’d gone with a black skirt over black compression shorts, and I forgot to bring my usual running undies (because they weren’t on the list!) but luckily I had a spare pair that would hopefully do the trick. On top I had a BRAND NEW TOP which I had only received on Friday night, a very awesome ‘Vegan Beast Mode’ top which was organised by Simon and made by Mekong Athletic, the clothing company started by Simon’s brother Ben and his partner Dai. I love their stuff – and the fabric on this top in particular was so luxurious! (I’m not sure if I would have run the 105 in a brand new top but I figured I was pretty safe in the 35k. In previous years doing the 105 I’ve changed tops at the 57k mark anyway so I’ve never ever worn the same top for a whole 100k) I also had my rainbow arm warmers, cycling gloves (to protect my hands from electric fences, barbed wire fences and possible falls! ), a hat, sunnies and a buff around my neck (mostly to pull up over my nose and mouth while running on a gravel road if a car went past). I had originally planned to wear a different outfit, similar to my Boston outfit, until I found out that the Vegan Beast Mode tops would be ready! I brought the original outfit with me anyway and showed both outfits to Tania at the dinner to see what she thought. Tania immediately chose the new top with the black skirt. So if there were any issues with the new top I had someone to blame! After brekky and getting my gear together (I’d done most of it the night before) I was out the door just before 4:45 and off to Myponga for the bus. In my pack I had: 2 bottles of Gatorade, 2 extra scoops of Gatorade for a possible refill, 2 nut bars cut into pieces, 2 Clif bars, a Zip loc bag of sweet potato chips, one peanut butter sandwich (in quarters) and one chocolate spread sandwich (in quarters). I wasn’t anticipating needing anywhere this much food but I always like to have a variety of flavours and textures, plus I would want something to chow down on after I’d finished! Mandatory gear-wise we had a lot of the same stuff as the 105k and 57k people, only we didn’t need hi-viz vests and head torches! Given that the first checkpoint where we could have drop bags was at CP2 (our finish line) I would have to carry all my stuff on me. As my car would be at CP2 I didn’t bother with a drop bag, I just left everything in my car that I would need afterwards. As the weather forecast was for a relatively mild morning, I was hoping not to have to stop at CP1 at all – the only reason would be to refill my bottles, but if (as I expected) I didn’t drink much in the first half of the race, I’d have enough on board to get me through to the end. As I was hoping to be done under 4 hours, I hopefully wouldn’t even need to reapply my sunscreen (but I did have it in my pack just in case). I hadn’t looked at the 35k start list. It was the same last year with the 105 and also this year with the 12 hour. I prefer not to know who else is on the list! Whatever plan I have is based on me running my own race, and knowing who else is out there shouldn’t change that. It was only a small busload of people leaving from CP2 – familiar faces Dione and Toni, Tim and Adam, and one other guy (Kevin) who I hadn’t met before. Victor Harbor at arse o’clock! We arrived at the start line in time to see the 6am 105k runners head off, and I had enough time to collect my race number and mandatory map (as if I was even going to refer to that – I had the offline maps app on my phone which I would be far more likely to use), sneak into the bushes for a last minute pit stop, and at the very last minute put sunscreen on while Race Director Ben was giving the briefing. Snapped by Glen doing my sunscreen! On the start line, other than those I’d seen on the bus, were familiar faces Luis, Atsushi, Laura, Candice, Marlize and Lauren. Lauren had won the 35k last year and Marlize had won the first 6 hour event that I did. There were quite a few people there that I didn’t know, but I could safely say that 3rd place would be the best I could hope for! Ready to go! Thanks to Ziad for this pic! Just minutes before the start! Right on time at 6:30 we set off. Luis, Atsushi, Tim, Marlize and Lauren were off like a shot, and I ran briefly chatting with Candice and said “My race plan is NOT to try to stick with those people in front”. I didn’t see most of them again until after I’d finished! I was expecting to be mostly running on my own. I expected to pass many of the 6am 105k starters, as they were going 3 times as far as me! I expected to be passed by many of the 7am57k and 105k runners. But I wouldn’t be running WITH any of them. That didn’t bother me – I’m quite happy running on my own especially for a relatively short distance. I kept Adam in sight, I have run with him before and he’s probably just a bit quicker than me but he had just got back from a 2 week overseas trip so he was, by his own admission, a little undertrained! Also ahead of me after passing me quite early on was Derek, in hi-viz yellow so he was easy to spot! The first people I passed were Ros and Mal, which confused me a bit as they were fellow 35k runners and I hadn’t seen them at the start! Turned out that they had started at 6, along with another group of runners who I passed shortly after. I then started to pass some of the 105k runners including Kym and Kristy, and another group including first timer Linna, also in hi-viz yellow (it seemed to be a popular colour!). 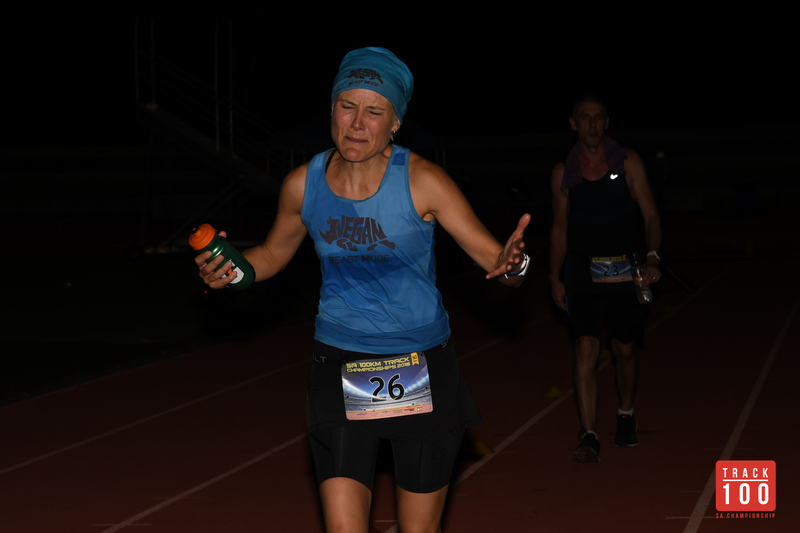 Also early on I ran past Kim, who was doing the Heysen 105 for the first time, and after having had to pull out of UTA 100 last year, it would be her first 100km. I made a decision that I was going to try to run the whole way to CP1, approximately 18km, with about 400m elevation. I figured it couldn’t be any harder than a Chambers loop! Eventually I caught up with Adam and we ran together for quite a while. 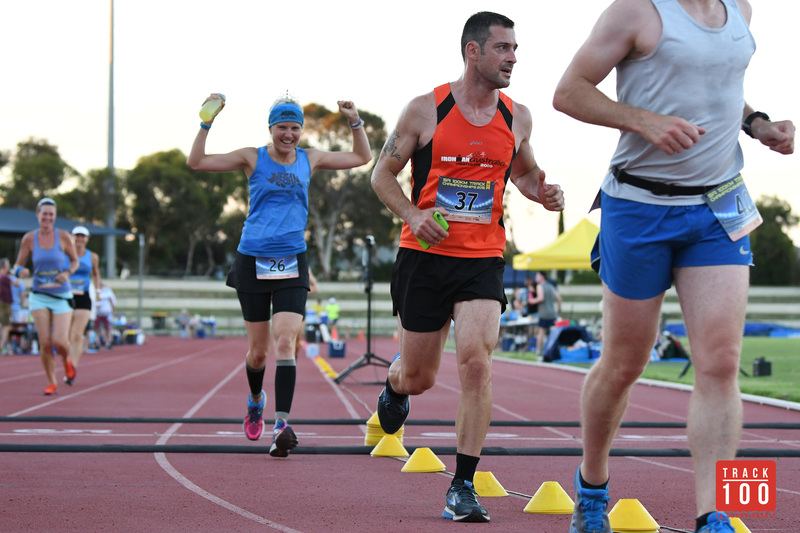 He had run the 57km last year and had been entered in the 57 again this year but after a less than ideal preparation had ‘downgraded’ to the 35. Having fully expected to be on my own for the bulk of the race, it was nice to have someone to run with for what turned out to be a fair chunk! During one particularly long road section, I commented “I don’t remember there being this much road in this section!”. Some time later, Adam remarked “I always get nervous when I can’t see someone in front”. You can see where this is going, can’t you? A little further down the road we saw our first and only kangaroo for the day. It was some form of consolation, as we soon found out that we were never meant to see that kangaroo. Because we were no longer on the Heysen Trail! Luckily it wasn’t a very long road (for the record, the road is called “Roads Lane” in Inman Valley) otherwise it could have been quite disastrous! Looking at maps after the event, I am estimating it was around a 2km detour. We were running and chatting, and failed to notice that there were none of the distinctive red and white Heysen Trail markers on this road, nor was there any of the red and white tape flapping in the breeze, signifying that we were on course. It wasn’t until we reached the T junction with Inman Valley Road that we knew that we had ventured off the Heysen! Quickly I got out my MAPS.ME app (thankfully I had re-downloaded it, after having previously deleted it to free up space on my phone!) and could easily see we just needed to head back down Roads Lane, and we would meet up with the trail again. And as we ran, me consulting my map frequently, we were quickly approaching the missed turn off. I would guess it cost us about 10-15 minutes all up. Despite planning to run the whole way to CP1, I did walk for a bit after that. My watch showed about 16km but I wasn’t sure at that stage how far off course we’d gone, so therefore I didn’t know how much further CP1 was! One positive thing I can say about the whole experience, and it probably has something to do with the fact that I wasn’t alone at the time, is that I didn’t let this little ‘mishap’ ruin the rest of my race. After my notorious misadventure just past CP3 in 2015, I did lose the plot a bit and it probably cost me a sub-14 result. This time I was a little annoyed but was able to refocus my attention on the job at hand! One thing I had no idea about though, was if I was still in 3rd place. Someone could easily have slipped past unnoticed while Adam and I were on our detour! We did eventually reach CP1. CP1 is a weird one, you have to take a right turn, run to the hall where CP1 is located, do a U-turn back to where you turned right, then turn right again. Even though I wasn’t going to stop at CP1 I still had to do this little manoeuvre, to get my name checked off at CP1. Adam made a stop here but I just went straight back out. I had a bit of ground to make up! Adam ended up catching me not long after CP1 and we ran together for probably 3/4 of the next section. CP1-CP2 is what I believe to be the hardest section of the whole 105. Many would say CP2-3 is the hardest, being 22km between aid stations, and with some quite challenging terrain and exposed sections, but as someone who is not the greatest at uphill running, for me it’s 1-2. I managed to run the first little bit but then I came to this section. Steeper than it looks! That’s Adam just in front of me, and the dot in the distance is Tyler. This was the ONLY place I took photos during the race! Looking back, while walking up the hill! Adam was just ahead of me at this stage. This was where Tyler, leader of the 57km race, came flying past us. A little further up the hill though, I saw him walk! And not too long after that, I was passed for the first (and as it turned out, only) time by a 105km runner. That was Dej, looking in great form after having to walk much of the 105 last year due to injury. There was quite a bit of single track in this section. Adam was just behind me, and I kept asking him if he wanted to pass, but he said he would probably drop back a bit, and for me to go on ahead, which I did. 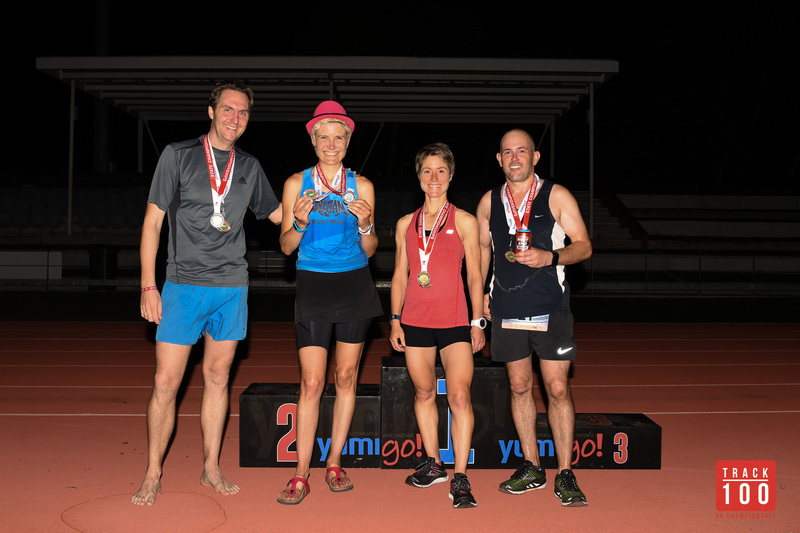 Not long after this, I ran into Justin and Vicky, who were aiming for sub 16 hours, which would earn them a belt buckle. (The belt buckle is a relatively new concept in Heysen but it’s been around for a long time in large international ultras. Last year all the 105 finishers got a buckle, this year only the sub 16 finishers would get one, and the remainder of the finishers would get a medal). I ran and chatted with Justin for a while, and told him about my little ‘adventure’. He was the one who had put a permanent plaque with my name on it, on the pole where I had got lost in 2015, so I did hesitate to tell him the story, but I figured he’d find out eventually! There wasn’t much chance of him getting lost out there, as the organiser of the training runs this year, he knew the trail like the back of his hand! And then came quite a lot more road as we approached CP2 and the 35k finish line! On the approach to the finish line I passed quite a few more 105k runners including Bec and first timer Cherie (who got a quick good luck hug from me, I was getting pretty excited as I knew I couldn’t have long to go! I then saw Stephan up ahead, I almost caught up with him, I got close enough for a quick chat and then I decided to walk a bit, I could see there was no-one anywhere near me that could pip me at the post, so I figured I had nothing to lose! He was still looking pretty strong at this point, although he has always been much better than me on the uphills! Heading into the checkpoint I started to see some funny signs that were a welcome sight – I was already pretty happy given that I was almost done, but I’m sure they would have been even more welcome for the 57 and 105 runners who still had a long way to go! (They probably wouldn’t have been quite as excited as me to see the sign that said “35km runners – 1km to go!”) The signs were the work of one of the amazing volunteers at CP2, Brenton. He told me he had measured it out in his car! It was the first real indication I had had, after my detour, of just how close I was to the end! I saw Luis and his distinctive red calf sleeves up ahead, and I tried to catch him, but he turned around, saw me, and found another gear! He later thanked me for giving him a bit of a push at the end! The volunteers at CP2 were amazing – all dressed up in Halloween theme and happy to do anything needed for the runners! Thanks so much to Karen, Debbie, Brenton and Penny in particular – you really made me want to hang around there longer! Such a fun atmosphere! Best. Aid station. Ever. Pic stolen from Dione! I had to have a laugh at one of Brenton’s signs, ‘Susan’s checklist: Eating? Drinking? 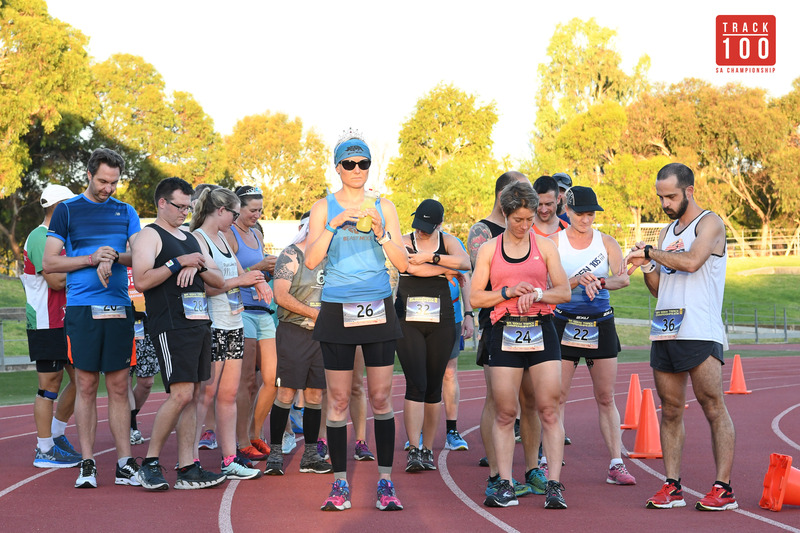 Weeing?’ – this was a reference to the head first aid officer Susan at the 24 hour event who would ask the runners these 3 questions at regular intervals! Unfortunately in relation to the 3rd item on the list, there was no toilet at CP2! Susan would have approved of this I’m sure! My first priority was getting my shoes off and getting my chair out of the car to sit down and watch the rest of the runners come in! Tania offered to go and get stuff out of my car for me but I said thanks but no thanks, she’d never find ANYTHING in there! So I went for a slow walk to the car, and wow did it feel good to get my shoes and socks off! We had the presentations soon after, another piece of silverware for my collection, to go with the beautiful looking medal! I had hardly eaten any of my food, and I always expected to have plenty of leftovers, but I think during the race itself I only had 2/3 of a nut bar, 1/3 of a Clif bar, and 1/2 a sandwich. I did drink about a litre of Gatorade, definitely not enough but I had another litre ready to go for afterwards! I got to see a lot of the runners come through CP2 which was great. After finishing just after 10:30 I didn’t leave until about 1:00! I decided to stay and wait for Mal and Ros to finish, as there was no hurry for me to get to the finish line. 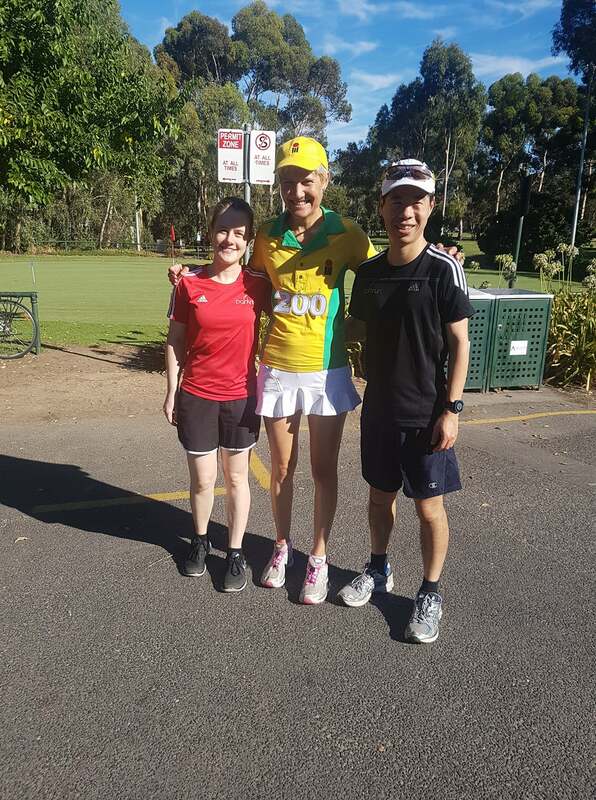 In the 105 I saw the first 2 women, Bronwyn and Kazu, who were unbelievably close together – it was going to be a great race! Not far behind was regular running buddy Zorica who was smashing it! I started to get a bit cold so I decided to do a full wardrobe change in the car. This was a bit challenging as the car was parked on James Track, and the 57 and 105k runners had to run straight past me as they left the checkpoint. So I had to time my manoeuvres in between people coming through! Particularly challenging was getting my post-race recovery compression tights on! I was halfway through putting them on when I could see Graham (doing the 57k) approaching. I quickly wound the window down and gave him some encouragement, hopefully he didn’t notice that I was only half dressed at that stage! I also saw Glen, doing the 105, and he asked me what I was doing – I told him I’d done the 35 and was now finished, he responded by (jokingly I hope!) calling me a “slack b****”! I went over to Merrilyn, who had her own little aid station set up, waiting for husband Mal. She offered me a coffee which I gratefully accepted! Also there was Maurice (the maker of the brownies!) who was waiting for his wife Sue who was also in the 35k. Maurice also asked me “why the 35k?” I had a feeling I’d be asked that a lot! I was having absolutely no regrets about my decision, no FOMO whatsoever! I saw Kristy and Kym, still going strong. Kristy had pulled out at this point last year so she said she would be much happier once she’d got PAST this checkpoint! Around the same time, Candice finished, she thought she had beaten her time from the 35k last year, and she needed to be reasonably speedy as she then had to go to work! Now that’s dedication! Mal and Ros finished not far behind, as did Dione and Toni, all having had a good day out, and I then decided it was time to make a move! Eventually I made it to the 105k finish line in Kuitpo Forest. Things were starting to take shape, with Race Director Ben and super vollies Michelle and Tracey getting things set up. Michelle and Tracey were in the middle of an incredibly long day – after having been at the start line from arse o’clock until after the last runners had set off, they then had to mark part of the last section of the course! You see, generally the course marking is done on Thursday and Friday in preparation for Saturday’s race, however Friday was a total fire ban, meaning there was no access to the forest. (It also meant that the people who had intended to camp in the forest on Friday night had to make other arrangements at the last minute). Fortunately the conditions on Saturday were ideal! The finish line was an awesome setup, with lots of lounges and warm blankets, and little fires to gather around. What a welcome sight this must have been for the 105k finishers! I borrowed a tent from Tracey, and thought I’d better set that up straight away, before it started to get dark. I’m not a frequent camper, so I didn’t fancy trying to set it up in fading light! With admittedly a little bit of swearing, I can happily report that I did eventually manage to get it set up all by myself! My digs for the night! There wasn’t a huge amount for me to do – helping to set up gazebos, and cutting up watermelon on the world’s smallest chopping board! And eating Michelle’s amazing chocolate hummus – OMG! This is NOT the best way to get the ropes attached! Robbie’s 105k race had not gone according to plan but he did manage to find an ingenious use for the podium to get the ropes attached! A ranger vehicle pulled in to the carpark opposite where we were. He advised us that there was a total fire ban from midnight! Fortunately we were allowed to stay but we were told we had to vacate by 9am, and all our fires had to be out by midnight. And then it was time to wait for the first runners to come through! 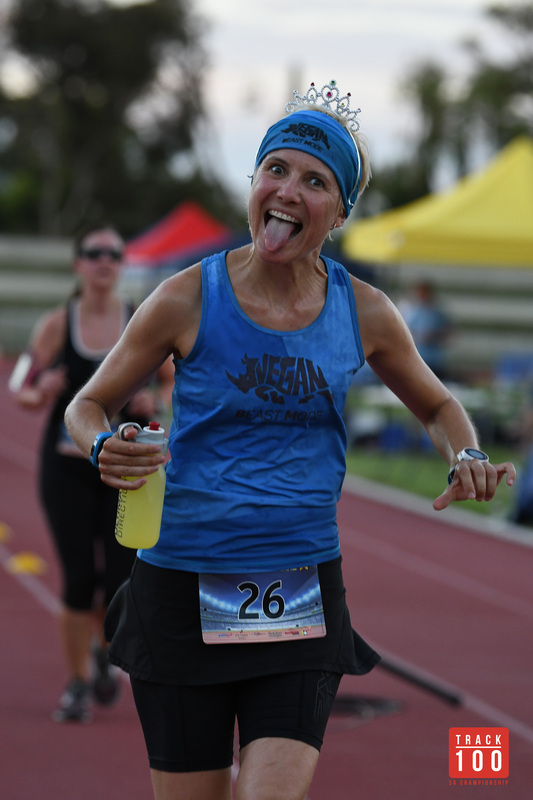 Having had the privilege of seeing practically EVERY runner cross the finish line at Yurrebilla, it was exciting to be at the finish line before dark and able to watch the pointy end of the field come through! And because there wasn’t an actual podium for me to stand on at the end of the 35k, I decided to get me a podium pic while I was waiting! It’s not quite the finish line, and only one out of the three spots is occupied, but it’ll do! Tracey and I decided to have an impromptu jam session while waiting for the finish line action to start! First across the line in 11:18 was the very popular winner in Dej (along with his buddy runner Daniel) who still looked remarkably fresh! Dej triumphantly crosses the line! He then had a brief sit down on one of the recliners, but there wasn’t much time for resting as the first female finisher was hot on his heels! 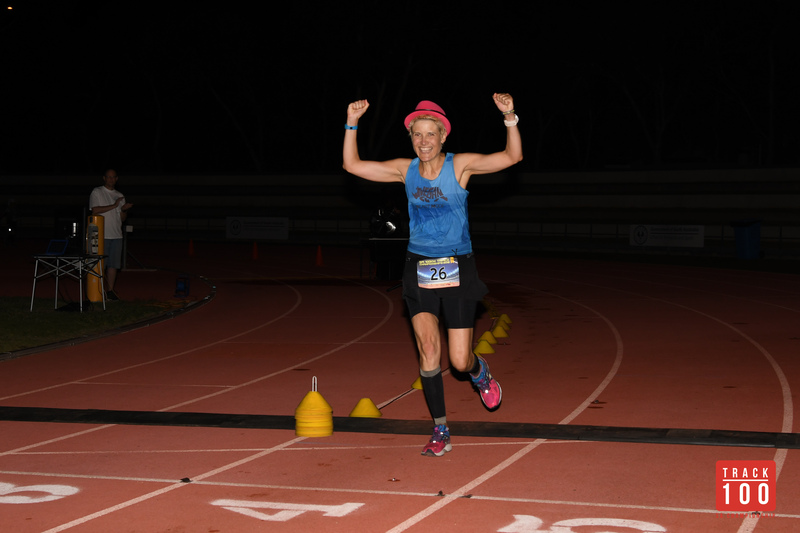 Bronwyn was the first woman across the line in 11:21, backing up her win in 2016. Quite a dramatic improvement from 2 years ago when she finished 3rd in around 13 and a half hours! Bronwyn was accompanied by her buddy runner, Howard, who won Heysen in 2016! What a great run by Bronwyn! Dej congratulates Bronwyn as Howard follows close behind. Race director Ben congratulates Bronwyn on her big win! 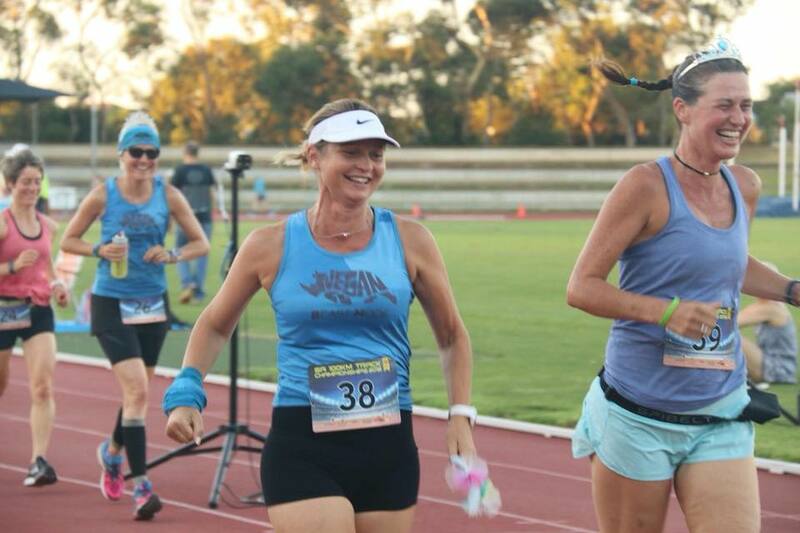 Next to finish was 2017 Yurrebilla winner Kazu, with her buddy runner Tracey. Kazu also finished second to Bronwyn last year. She is having a great year! Kazu and Tracey cross the line together! 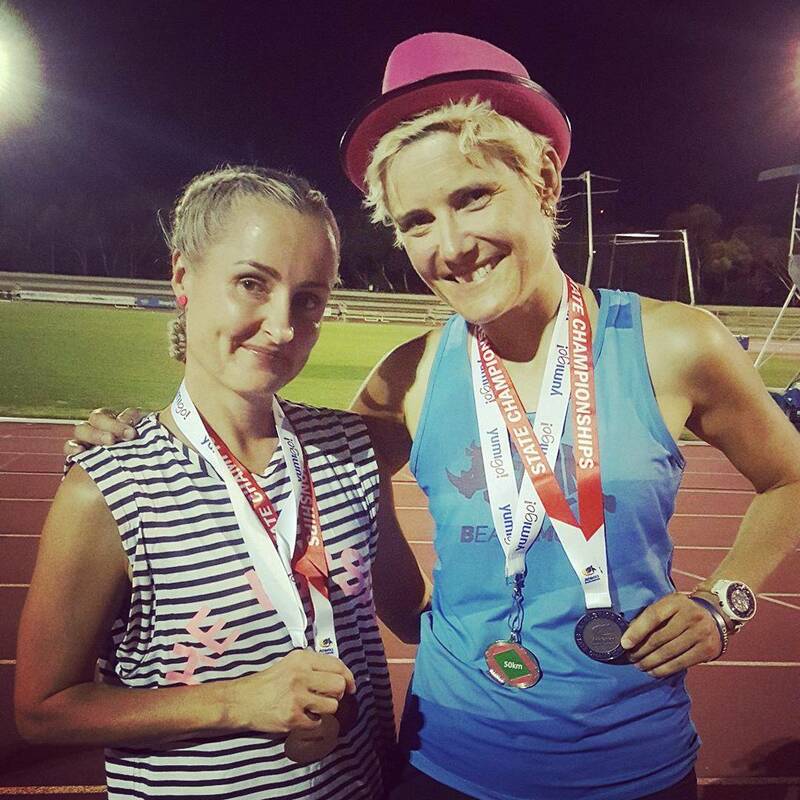 Dej and Bronwyn share top spot – nice work both of them, getting up on the podium after running 105k! Technical difficulties! After snapping this pic, I offered my assistance – my height proved to be a bit of an advantage here! There was a bit of a break after that before the male podium was complete, thanks to the familiar faces of Shaun and Chris, who frequently run events together. I THINK it was Chris who finished second in a sprint finish, with Shaun close behind in third! Dej waiting to congratulate Shaun and Chris! Not quite sure what Shaun is doing here! And Dej doing his signature pose! I was starting to get a bit tired (soft, I know – I only ran 35k!) but decided to wait for the 3rd female to cross the line before hitting the tent for a nap. 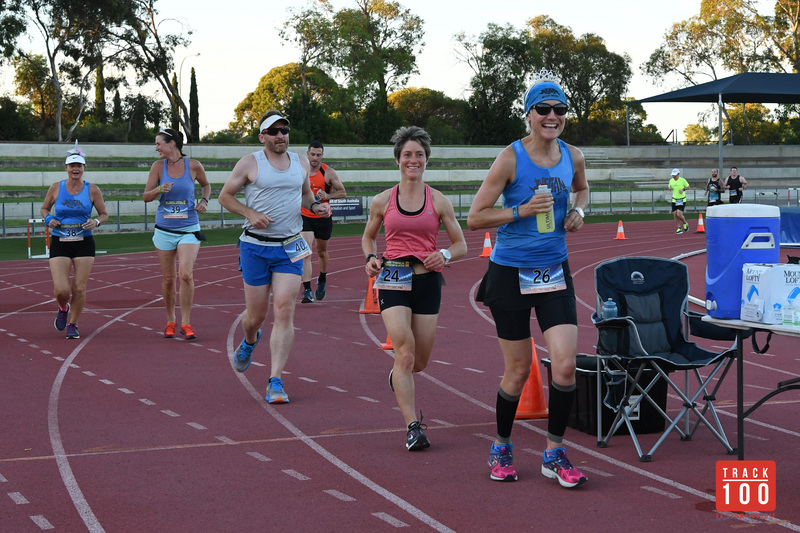 It was close between Linda and Zorica, in the end Linda took the podium spot (accompanied by her buddy runner and husband Brenton) with Zorica not far behind in 4th place. After the presentation for the women (Bronwyn and Kazu were both still there, nearly 2 hours after finishing!) I decided to hit the hay. A couple of the awesome finish line vollies, Rula and Rebecca, making sure the runners had plenty of fuel when they finished! Eventually I heard Kym’s voice at which point I decided I needed to get up. If Kym was there, that meant his buddy runner Kate was also there, and I’d promised her some vegan Baileys. It was 3:30am! 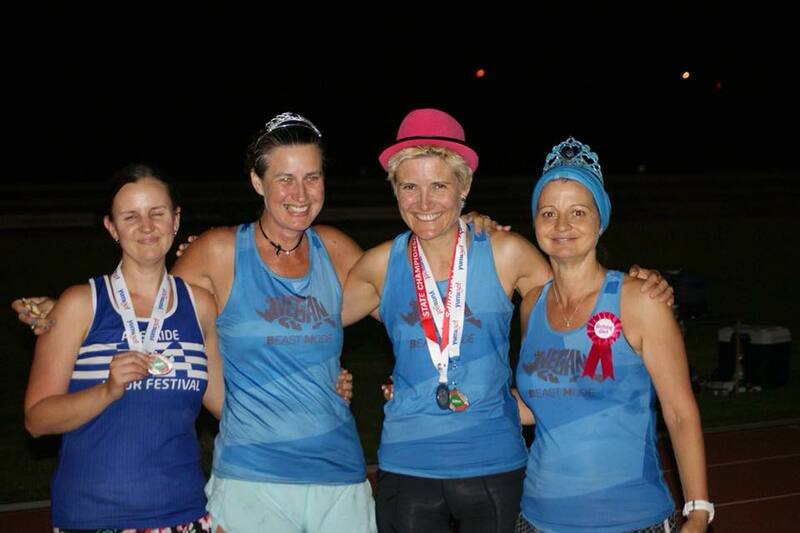 I’d been in the tent for 7 hours and missed the bulk of the finishers including first timers Cherie and Sam who both smashed it, along with Vicky and Justin who earned their belt buckles, as did (a different) Kate. Uli was also there, wrapped up in a blanket looking very relaxed on one of the couches! Good thing I got up when I did, because I was just in time to see Kim finish her first 100k! And here is my favourite story of the day. Kim had missed out on ordering an event T-shirt, as they’d sold out quickly. She was doing her first 100, and had wanted to mark the occasion with a T-shirt! Undeterred, she went about designing her own T-shirt. She traced the outline of a kangaroo from the Heysen shirt from a couple of years ago, with her finger on her phone. She described it as looking like a kid drew it. She then got it made into a transfer and managed (with some difficulty) to find a white running T-shirt to transfer it onto! And so she had her own, unique, incredibly special memento of her awesome achievement! Kim and her special T-shirt – pic courtesy of Sheena, taken at Checkpoint 5 earlier in the evening! 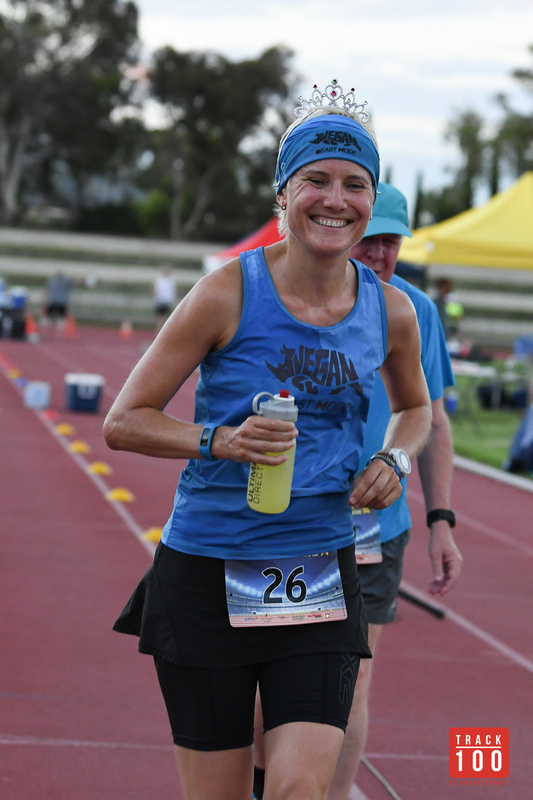 Gradually the other runners crossed the line, Kim was happy she’d finished, AND as a bonus didn’t finish last! And then, the only runner left out there was a guy called Tass. I’d met him at the 24 hour earlier in the year (I think he was in the 24 hour event) and when I saw him all those hours earlier at CP2, I thought he was already looking a little bit wonky! He was accompanied overnight by the sweeper Beck (if you’d read my report from last year, Beck was the buddy runner for George, and also ran Western States and UTMB last year, as well as being the overall winner for the inaugural Hubert 100 miler earlier this year! This was a bit of a contrast from that! Unfortunately Tass didn’t quite make it, he had to pull out with only about 4km to go, apparently he just could not walk another step! Once Tass was out, that was the race over! Ben went out to pick up Beck (Tass had been picked up by the first aiders) and the huge process of packing up the site began! It was probably 5:30ish by this stage – so I decided it wasn’t really worth going back to bed! At the end of the party! I can think of worse places to spend a Saturday night! Many hands make light work as they say – Ben, Michelle and Tracey who had been there for well over 24 hours, did the bulk of the work but there were a few of us there to help load the gear into the trailer and Ben’s car! Remarkably, one of them was Uli, who had run the 100k, had a bit of a nap and then was there right to the end, helping to pack up! We eventually got out of there about 7:40am, well before our deadline of 9am. So now, I guess it’s time to give some thanks. I apologise if I miss anyone – there’s just so many! Next I have to thank the volunteers, special thanks must go to Michelle and Tracey who put in a ridiculous amount of hours to making this event happen! You girls ROCK! I don’t think I can put into words how grateful I am for everything you’ve done! Also I must thank the CP2 team for being awesome. So much fun! Merrilyn, who already does so much for the running community, for making me a coffee after I finished. Never has an instant coffee tasted so good! Simon and Clo, for giving me a place to stay on Friday night and a bloody amazing vegan feast to fuel up for the run! And Whiskers the cat for making sure no-one attacked me in the night! Kate, for coming out course marking with me on Friday. It was such a great day out! We must do it again! To all the runners in all the events for being so friendly, encouraging and supportive of the other runners. That’s what I love about this community! Such a great day. Such a great event. See you all there next year! 250 times around a 400m track. Brutal. When I first heard about this event I was keen to enter. I’m not sure why, but it just appealed to me. 100km on a track, with a 12 hour cut off. 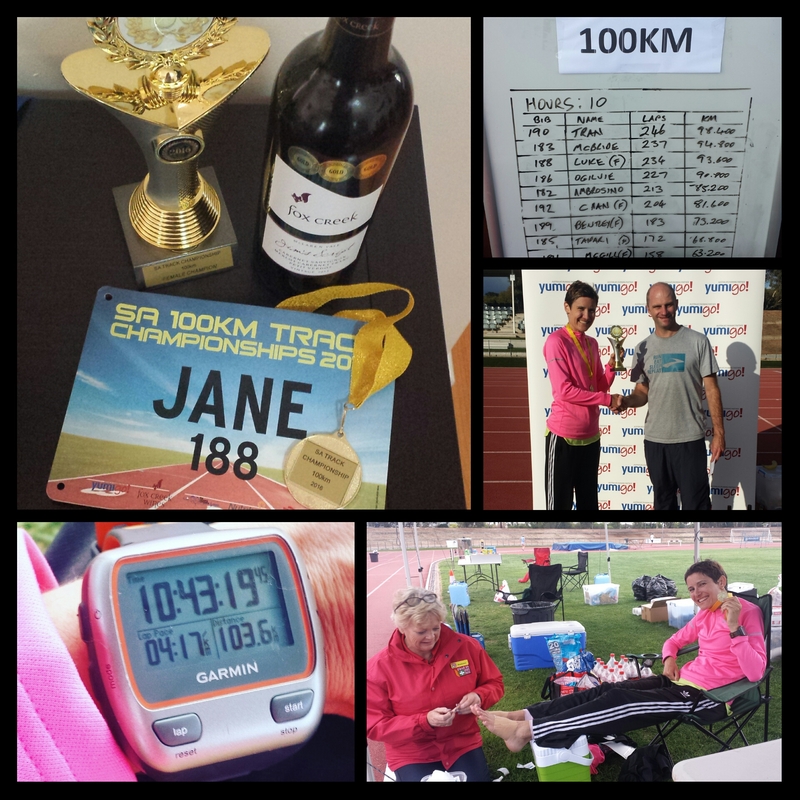 I had only run 100km once before, in a trail ultra, in just over 14 hours. But on a dead flat track it should theoretically be easier. Faster, certainly. 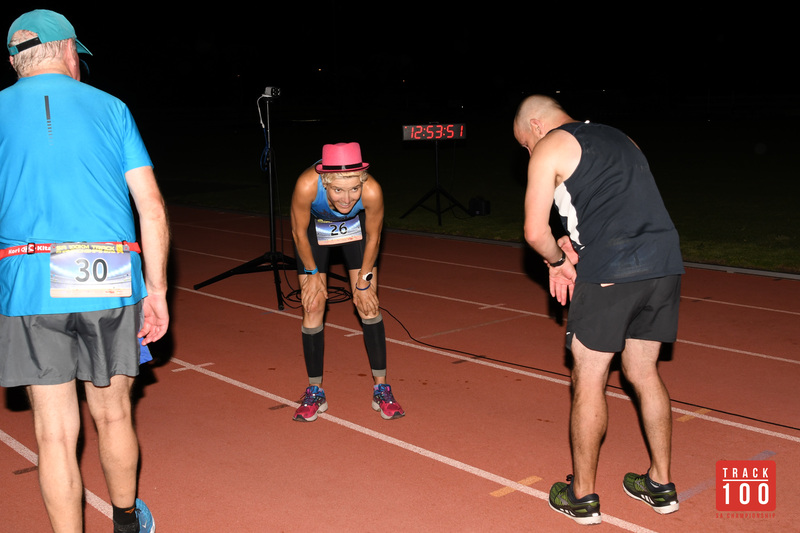 There are so many pros to running an ultra, on a track, at night. No possibility of getting lost. No need to carry any food, drinks, mandatory gear. No sunscreen, sunnies or hat required. Never more than 400m from food, drinks and toilet. My race week was quiet. I had two fairly challenging trail runs on Sunday and Tuesday. After Tuesday’s run, which involved a stupid amount of stairs, I decided I wasn’t going to run again until the big day. I did one easy walk on Thursday and that was it. Food-wise I took 3 sandwiches (a combination of peanut butter and chocolate nut spread), a couple of nut bars, some almonds and some mashed sweet potato in a tube. And a big container of sports drink. On the day I thought I’d better switch my meals around. As the race started at 8pm, and I was used to eating cereal (or a cereal-based smoothie) for breakfast before a run, I thought it would make sense to have breakfast for dinner! So I had smashed avo and chickpeas on toast for brekky, sweet potato vegan mac and cheese for lunch, and cereal for dinner. In between lunch and dinner I managed to sneak in a few hours sleep. I went with my favourite long distance running skirt over Skins shorts, and on the top a singlet I’d worn for my first two marathons and my rainbow striped arm socks. I also threw into my bag some clean singlets, long sleeved tops, buff, fleece headband, rain jacket (just in case), extra shoes and socks. As it turned out, the top was not the best choice as it started to chafe after about 50k, and consequently I finished the race in a different top. We had access to the stadium toilets for the duration. Unfortunately, they were up a flight of stairs! It was going to be a long night! Running around in circles can be tedious. I’ve run a timed event on a 2.2km loop, but this was something else entirely. I thought the track would ve easier to run on than the gravel of the Uni Loop. At first it seemed easier but as time went on, I found it really harsh on my feet, especially my toes. I could feel blisters coming on but I didn’t want to take my shoes off – mainly because that would involve sitting down, and I thought getting up and getting going again would be a struggle! I had expected the 250 lap thing would be the biggest barrier but as it turned out it was the track surface. Paul, the eventual winner of the 100k and with whom I ran a fair bit, changed shoes and socks after 50km and found that this helped a lot. The progress times were written up on a whiteboard every hour by event organiser Ben. After 1 hour I was in 8th place overall, 2nd female, one lap behind the first girl, Rebecca. (Interestingly eventual winner Paul was one place behind me). Also in the event were Sheena, a last minute entrant, and 2 Karens – Karen C who had come from interstate, and Karen B who will be well known to anyone who is a regular reader of my blog! On the male side, the people I knew were Paul, Barry (who was doing the 100k as a training run for a 48 hour event in March), and David who was going for a very fast time – possibly sub 7:30! 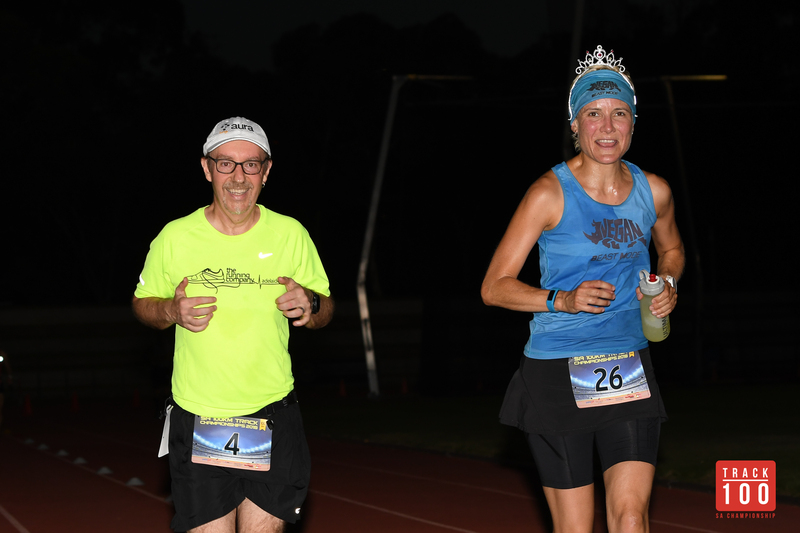 David lapped me pretty much every second lap but eventually withdrew – it wasn’t to be his night! Which then made for a very interesting race as he probably would have been a runaway winner. 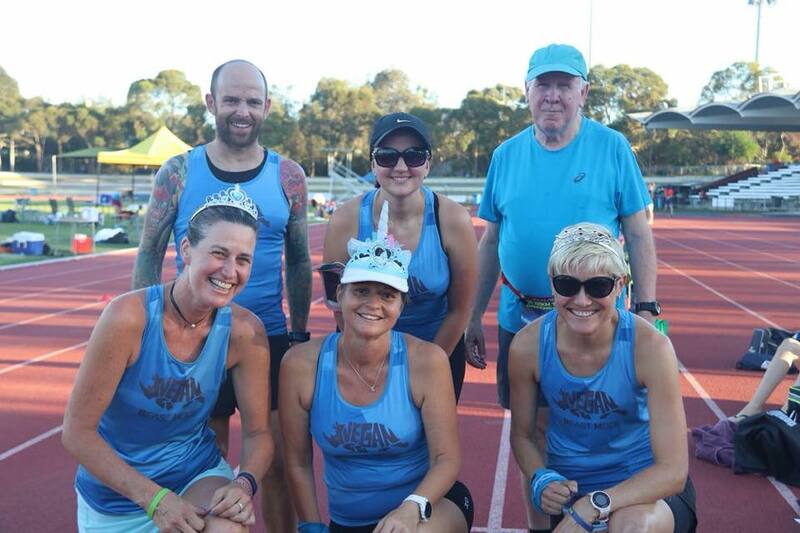 It was great having the 50km runners out there too. Many of them were going super fast, including Alex (the eventual winner), Simon (who led for much of the race and ended up finishing second, not bad for a last minute entrant!) 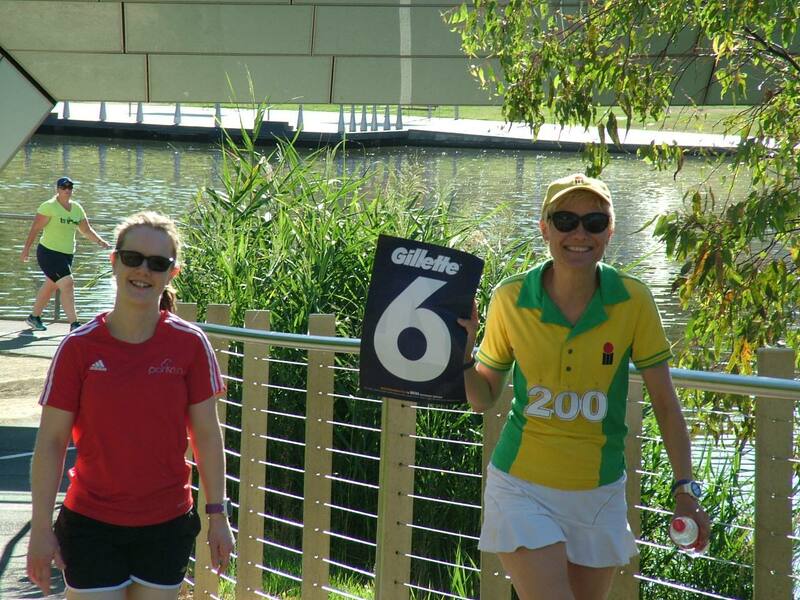 and on the women’s side Anna and Tina (who took out first and second place respectively) looked strong throughout. 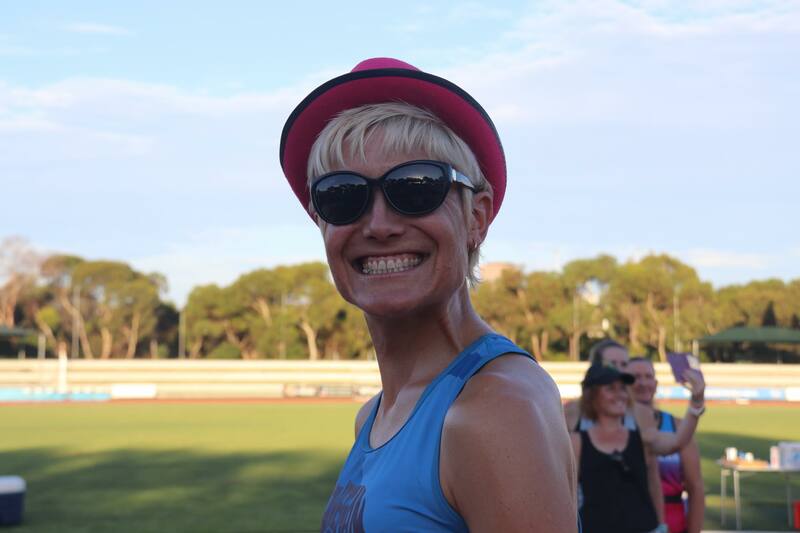 There was also Michelle, who was the 3rd placed female but took first place for most entertaining runner! She was the one who started the singing (she had her iPod in) and not long after that I decided it was time to pull out my iPod too. 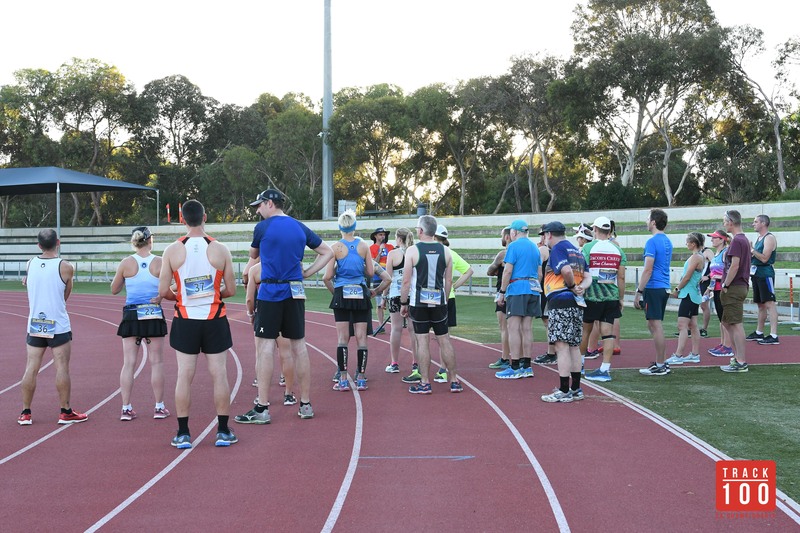 I don’t normally like to run with music but in an event like this where there are no road crossings, no marshal instructions to follow, not to mention the monotony of running lap after lap, most of the 100k runners and a lot of the 50k runners had iPods. To distract me from my feet and legs screaming at me, I started singing (pretty loudly, and hopefully in tune), much to the amusement of the spectators. I hope it wasn’t too off-putting for my fellow competitors! The laps went by quickly at first. 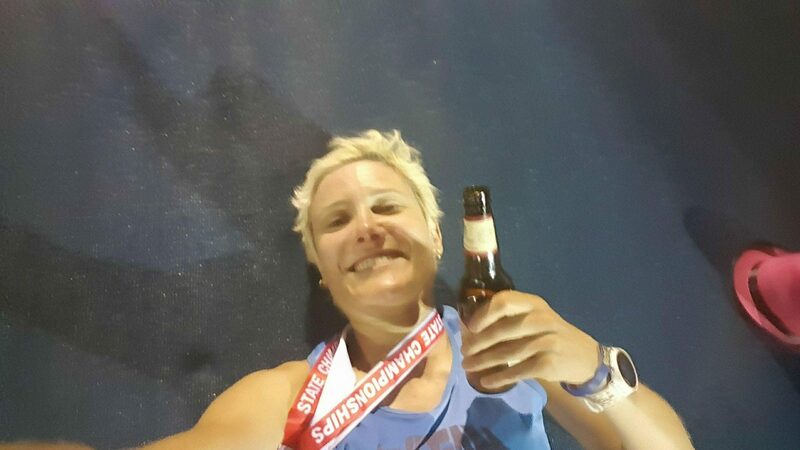 I was sitting on sub 10 hour pace until probably 65km (I haven’t uploaded my Garmin data yet due to tech issues) and it would have been amazing to be able to sustain that, but I knew it wasn’t realistic. I hoped/expected to finish between 10 and 11 hours. The support tent was fantastic. Every time I passed, the volunteers gave great encouragement and were always willing to help me with anything I needed. Ziad, Chris, Katie, Vic and anyone else I may have forgotten, ably manned the support tent/food table and I can’t forget to mention Kieran who I think came to support Michelle but even after she left he stuck around right till the end and was my unexpected but much appreciated support crew – what a champ! After 2 hours I had moved into 7th place and one lap ahead of Rebecca. 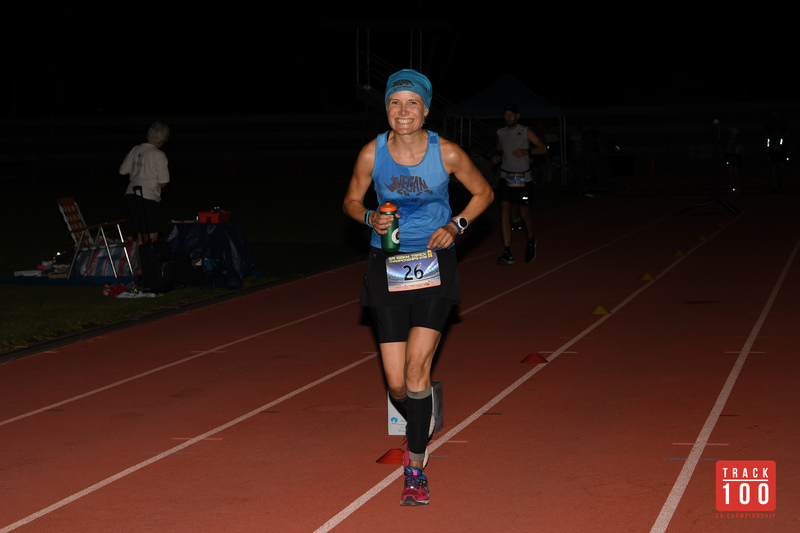 By 5 hours many of the 50k runners had finished including the top 3 men and top 2 women. I had just cracked 50k myself and moved into overall third place, one lap behind Barry and Stuart in equal first place. Somehow I had managed to open up a 13 lap lead over Rebecca, that’s around 5km. This gave me a little breathing space when it came to toilet breaks (I only had two – those stairs were a struggle – and managed to keep them to around 2 minutes which equates to 1 lap or less). At 6 hours I had moved ahead of Barry into overall second behind Stuart. My lead over Rebecca was now 17 laps. Paul had moved into 4th place, one lap behind Barry and 2 behind me, and looking incredibly strong. By 7 hours Paul had leapfrogged me into first place and that was where he stayed. My lead over Rebecca was now 22 laps, and a further 2 laps to Karen C in third position. I thought, surely neither of them can catch me now? Even if I end up walking most of it? Fortunately it didn’t come to that. I started with a 30min/5min run/walk strategy. After about 5.5 hours I went to 25/5 (it was easier to keep track, plus I was tiring). Later I tried 20/5 but quickly went to 15/5 and then 10/5. By the end I was doing 7/3 but still managing to maintain my position (obviously everyone, with the exception of Paul and possibly Barry, was struggling as much as, if not more than, me!). I was constantly checking my watch and counting down to the next walk break! At the 8 hour mark Paul had opened up a 5 lap gap between himself and second placed Stuart, who was beginning to struggle and was walking more than he was running. Paul was looking unstoppable and regularly lapping me! I was still 3rd, 3 laps ahead of Barry and 25 ahead of Karen C who had moved ahead of Rebecca into second place. Getting towards the pointy end, at 9 hours Barry had passed me into a strong second position, and I had passed Stuart so still sat in 3rd overall, with my lead over Karen maintained. After 10 hours Paul was practically finished and Barry only a few laps behind. Hearing Paul and Barry’s finishes called by Ben over the PA gave me a lift, as I knew I wouldn’t be too far behind them! My Garmin was well out, so I didn’t really know how long I had to go until Adam, the timing guy, started calling out numbers of laps. Once that number was into single figures I knew I was really nearly done! I was up to the 7/3 run/walk by then but once I got down to the last 3 laps I somehow managed to run the rest of the way. The best feeling was when Ben announced me over the PA as I started my last lap. I can quite safely say that was my fastest lap of the whole 250! I finished strongly and was glad to see some friends who had come to see the finish, including Neil who made it just in time to see my last lap, and James who had come down for the last hour or so before going rowing. Mum had also come down and had seen my last 3 or 4 laps – I didn’t realise she was there until I’d finished and it was a nice surprise as I hadn’t expected her to come! I finished in about 10 hours 43, just before 6:45am, in daylight! I then sat down, had some delicious vegan pizza, and Kieran helped me get my shoes off before first aid legend Susan came and taped up my epic blisters. It was only just over an hour until the 8am cutoff, and I sat back and watched the rest of the runners struggle around the track. Stuart finished 4th overall (3rd male) and another guy John was the last to finish the 100km, with 4 minutes to spare! The only other 2 left by that stage were the two Karens who stuck it out to the end but didn’t quite make the 100km. Still – a fantastic effort to keep going for 12 hours, I’m not sure if I could have done that! After the presentations Karen treated me to a guest pass at her gym where we had a very luxurious spa interspersed with quick dips in the cold plunge pool – perfect way to finish a very tough but very satisfying event! Thanks as always to Ben and all the amazing volunteers, all the supporters who came down to watch, and last but not least all the legends who ran in the event!